Venus Williams awaits the home favourite in the semi-final. 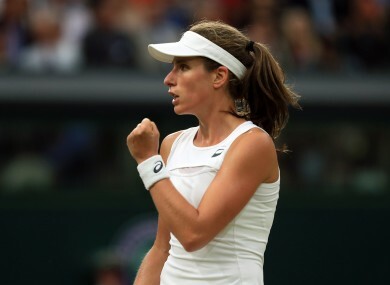 JOHANNA KONTA BECAME the first British woman to reach the Wimbledon semi-finals since Virgina Wade 39 years ago as the world number seven fought back to beat Simona Halep 6-7 (2/7), 7-6 (7/5), 6-4 on centre court. Konta thrilled the crowd in a quarter-final classic that ended second seed Halep’s bid to become the new world number one. The match ended with a touch of controversy controversy when a fan screamed out on match point Just as Halep went into her wind-up on a forehand to stay in the tie, a woman’s loud, piercing scream echoed around Centre Court, the sound amplified to dramatic effect by the closed roof. Halep was obviously distracted by the call and looked to umpire Kader Nouni to rule the point to be replayed. But no call was forthcoming and Konta too looked bemused as she walked to the net. “It was a woman on my end who screamed. I think she got over-excited about the deep ball that Simona hit. It was actually as I was hitting my ball, so I think it more affected me than my opponent,” insisted Konta. The Australian-born 26-year-old, who has never reached a Grand Slam final, faces five-time Wimbledon champion Venus Williams in the semi-finals on Thursday. Williams became the oldest Wimbledon semi-finalist for 23 years by brushing aside French Open winner Jelena Ostapenko. The American’s 73-minute masterclass on Centre Court clinched a 6-3, 7-5 victory that keeps her on track for a first major title since winning Wimbledon in 2008. Williams’ victory equalled her sister Serena’s total of 86 main draw match victories at Wimbledon, the most among any active player. She will climb back into the top 10 thanks to her Wimbledon run, but breaking Serena’s record to become the tournament’s oldest champion in the Open era is her sole focus. “I love this game. That’s why I put in the effort and the time. It’s a beautiful game. It’s been so good to me,” Venus said. “The competition keeps you growing. You have to get better if you want to stay relevant. Twenty years after making her Wimbledon debut, Venus was playing in her 100th singles match at the All England Club, while Ostapenko was in only her eighth. That gulf in experience was immediately apparent when Venus broke in the second game and cruised through the first set in serene fashion. Having stunned the tennis world by becoming the first unseeded player to win the French Open last month, Ostapenko was riding an 11-match winning streak at the majors. But Ostapenko, 20, was the youngest player left in the tournament and Venus has scythed through the draw by dispatching a series of opponents almost half her age, many of whom idolised the seven-time Grand Slam champion when they were growing up. Williams was just too canny for the fresh-faced Ostapenko, manoeuvering her out of position time and again before delivering the kill shot. After breaking in the third game of the second set, Williams moved into a 3-1 lead, then endured her only wobble as Ostapenko broke back. Williams was unfazed and shattered Ostapenko’s spirit with another break before serving out a commanding win. On the other side of the draw, Garbine Muguruza powered into her second Wimbledon semi-final in the last three years with an emphatic 6-3, 6-4 win over Russian seventh seed Svetlana Kuznetsova. Since winning her maiden Grand Slam title at the French Open last year, Muguruza has struggled to return to the top and this is her first major semi-final since that Roland Garros triumph. Muguruza, beaten by Serena Williams in the 2015 Wimbledon final, will face Magdalena Rybarikova in the last four after she overcame Coco Vandeweghe in a rain-delayed match that ended today’s proceedings under the centre court roof. The 23-year-old is being coached by Conchita Martinez, who became the only Spanish woman to win Wimbledon in 1994, and the lessons appear to have done the trick. “I played good. I’m trying not to think a lot, just go for it and play my game. I’m happy it worked out,” Muguruza said. “It seems far away since I last made the final here. I’m a completely different player. Halep’s defeat means Czech Karolina Pliskova, who lost in the Wimbledon second round, will replace Angelique Kerber on top of the WTA rankings. Email “Konta sees off Halep in gripping contest to end British wait for female Wimbledon semi-finalist”. Feedback on “Konta sees off Halep in gripping contest to end British wait for female Wimbledon semi-finalist”.